January 22, 2019 - por La Educación. 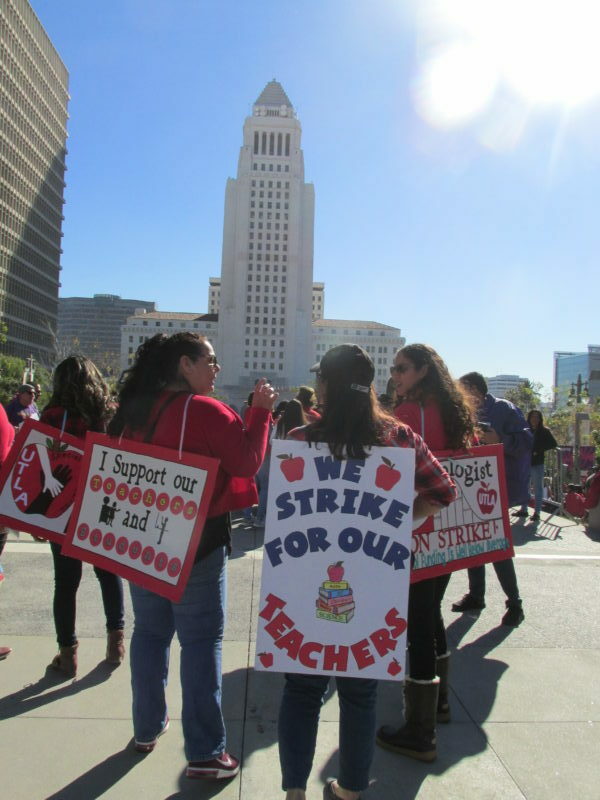 Maestros en la manifestación de esta mañana frente al Palacio Municipal de Los Angeles, donde UTLA y LAUSD lograron un acuerdo con la mediación del alcalde Eric Garcetti. After 6 days on strike along with parents, students and community members across Los Angeles, we have reached a historic agreement that addresses major issues impacting our schools, students and professions. Below is a summary of that agreement, which the UTLA Board of Directors endorses for a yes vote. funding. This includes but is not limited to funding for nurses, special education and community schools. The Mayor will also endorse the Schools and Communities First ballot initiative and will work together with LAUSD and UTLA on advocating for the passage of this initiative. Salary: A 3% retro salary increase for the 2017-2018 school year and a 3% salary increase retro to July 1st, 2018. A Nurse in Every School: For the 2019-2020 school year, the district will hire 150 full-time Nurse positions. For the 2020-2021 school year, the district will hire at least 150 full-time Nurse positions, which will provide a fulltime. Nurse at every school five days a week. Councils at community schools will have full discretion over all budgetary items outside of School Site Council. Teacher Librarian at every secondary school campus five days a week. Co-Location: By December 1 and February 1 of each year, the district will provide UTLA with a list of all schools threatened by co-location. At each co-located school site, a UTLA co-location coordinator will be elected and empowered to be part of the development of the Shared Use agreement. Testing: Beginning in the 2019-2020 school year, a joint UTLA/LAUSD committee will be created and tasked with identifying all district assessments. The committee will develop a plan to reduce the amount of assessments by 50%. extended for up to 28 schools. This will be phased in by the 2021-2022 school year and city services will be provided for student safety during the pilot program. Green Space: A joint Green Space Task Force between LAUSD, UTLA and the City of Los Angeles will be created and be charged with presenting a plan to increase green space including removing bungalows, removing asphalt, creating greener play areas, water retention systems, and Community School Parks by December 2019. UTLA Rights: Chapter chair sign off local school budgets and waivers, expanded chapter chair rights for subs and itinerants, including the right to speak about UTLA issues at district-wide and local district meetings. Protection of healthcare for striking adult ed and substitutes. Protection for striking substitutes to get continuity rate extended with strike. See the full TA on UTLA.net for more information. ¡Victoria para la educación pública! Vea el TA completo en UTLA.net para más información.